← Roughs for Earth Week!!!! I really like these two designs. At first I thought they were created via a variety of decorative fonts; yet, learning that the letter forms are created all by hand creates a distinct uniqueness to the piece. Anyway: I really like the usage of impaired readablity. The horizontal/vertical/diagonal formation of the words makes legibility stand out, making the words able to be legible but not fully readable. However, the way Mirman uses size in some areas distorts both readability and legibility making some words/letters hard to make out. Despite that, his choice of word usage reflecting both characters adds some level of understanding of what Mirman is trying to communicate via those words that are not fully readable. 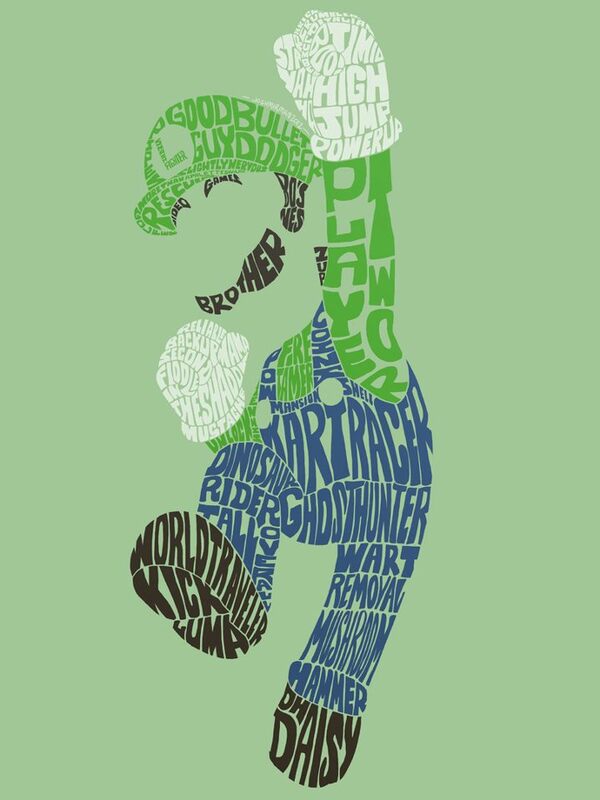 I love the background color in A Very Wordy Player Two (the Luigi design). The overall mellow green color scheme, makes the subdued background go with the overall piece. However the mustard yellow (color blind…so it may be orange?) color for the Mario design takes away from the composition. The reds/blues in Mario are indeed brighter than the subdued colors in the Luigi design; however, the yellow (or orange) background seems to make the design too “bright” and takes away from the words that make up Mario’s character. One thing I like in formatting the whole piece, is how the background colors don’t seem to subtract the creation of Luigi and Mario’s character out of the words. The background still appears behind the various words, and within the characters “body,” yet doesn’t hinder the overall creation of the characters out of the words. The words are still a cohesive unit and still able for viewers to make out to be the characters despite the bleeding of background into the character design. 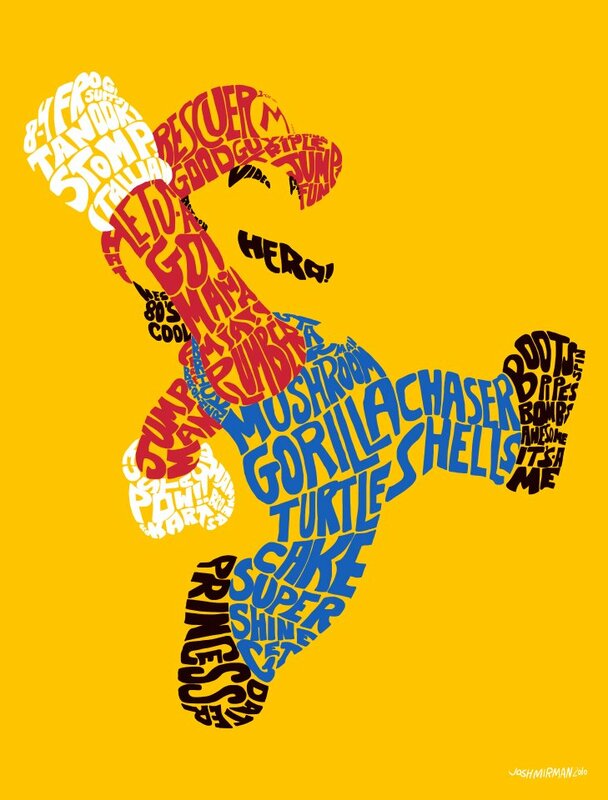 Another aspect I like in Mirmon’s Mario piece is how put his signature in the bottom right. However, in the Luigi piece, Mirmon’s name is running across the hat in white. It really doesn’t fit with the overall composition. Even if his signature was in green, it wouldn’t fit in the hat placement due to the words being Luigi-centric. I would advise a placement in the bottom right like the Mario signature. Overall: I really enjoy the piece. I love how Mirmon’s handwritten glyphs add to the creation. His drawing style seems to capture the overall childlike video game nostalgia style of his characters. Plus, it makes all the typographic characters seem unique, which adds an overall complexity to the piece.